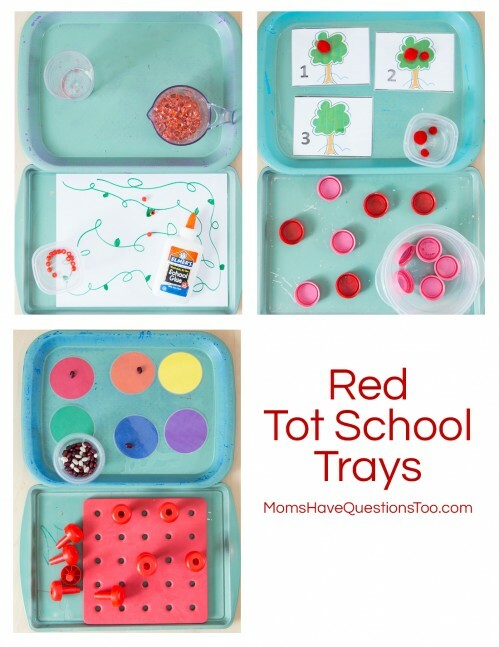 How can I teach the color red with red tot school trays? This is the last set of color tot trays that I will be doing with Smiley Man. After this week we are going to take a short break from tot trays, but we’ll be starting again with shapes in September. 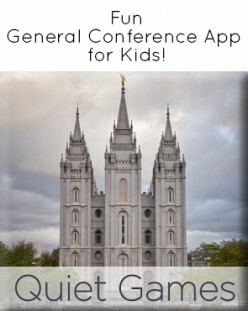 I love the new tot school that we are doing. I also love the new trays that I have been making. 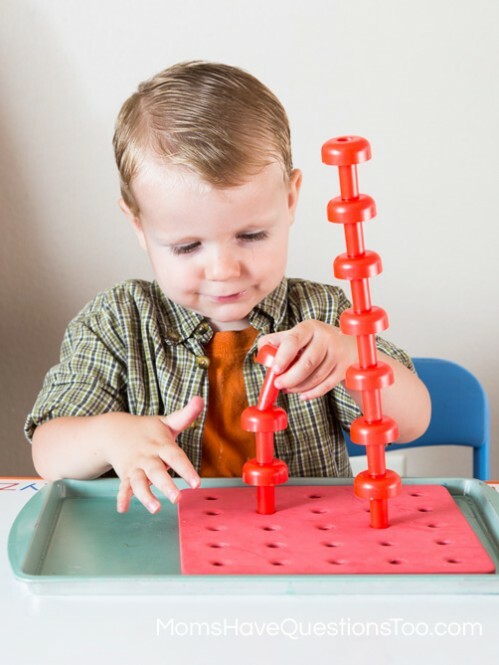 They are much more Montessori inspired and honestly, Smiley Man enjoys them more and he is learning more. He thinks he’s playing, but really he’s learning so much. It’s wonderful. This fun pegboard and peg set is from Oriental Trading. Smiley Man loves playing with these and they make a great Montessori material for toddlers. These color circles are the sand mounds from my colored fishies color game. To do this toddler school activity, I say a color and Smiley Man puts a bean on the circle of that color. A few months ago I couldn’t have even attempted a game like this, but now Smiley Man is really good at it. This was a great way to review all the colors we have been working on for the last 6 weeks and a great addition to our red tot school trays. 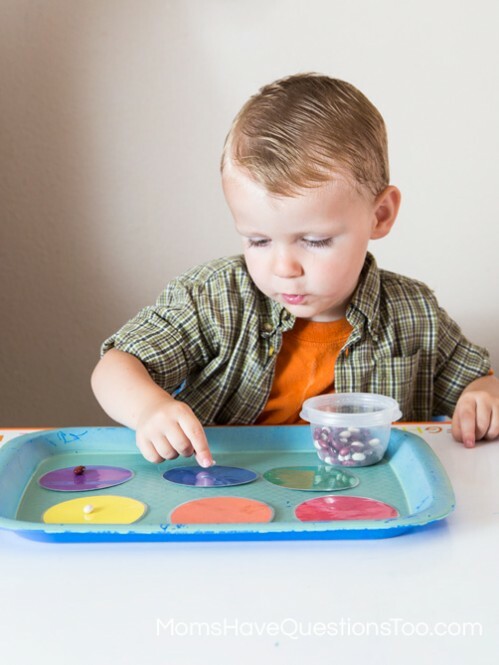 This is definitely a Montessori inspired tot tray. It has a measuring cup filled with red water beads and a clear cup. Smiley Man just has to pour the red water beads from the measuring cup to the cup. Then, he pours them back into the measuring cup. Smile Man got a little frustrated with our last pouring activity (water). He didn’t like it when the water spilled, even though I gave him a sponge to wipe it up. Some of my OCD genetics have definitely passed onto him. 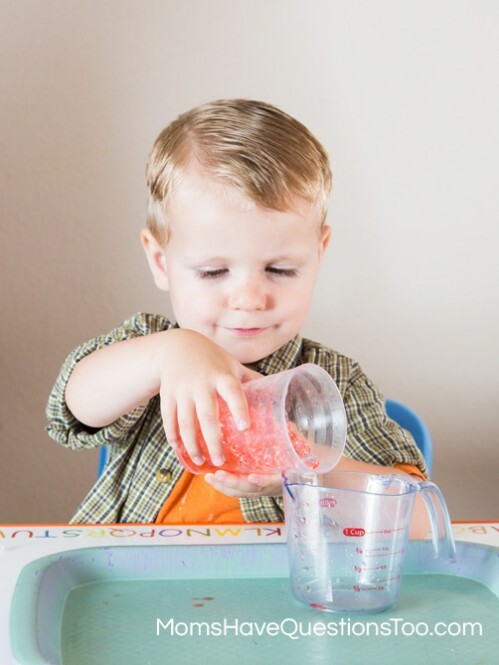 This water bead pouring activity was a great way to ease him back into pouring. 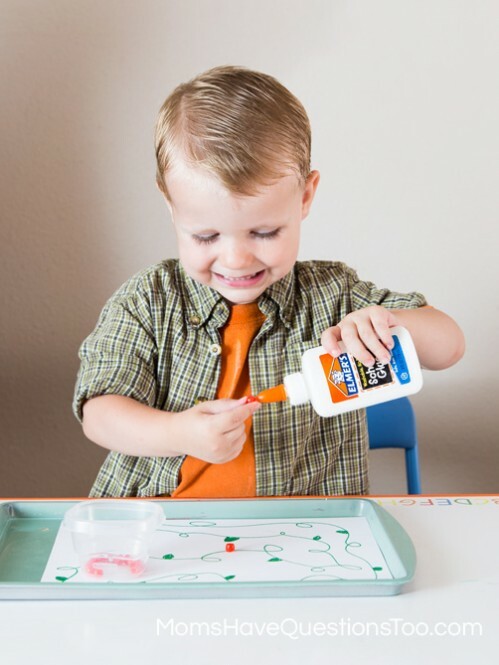 If he spilled some of the water beads, he could just pick them up with his fingers and put them back. 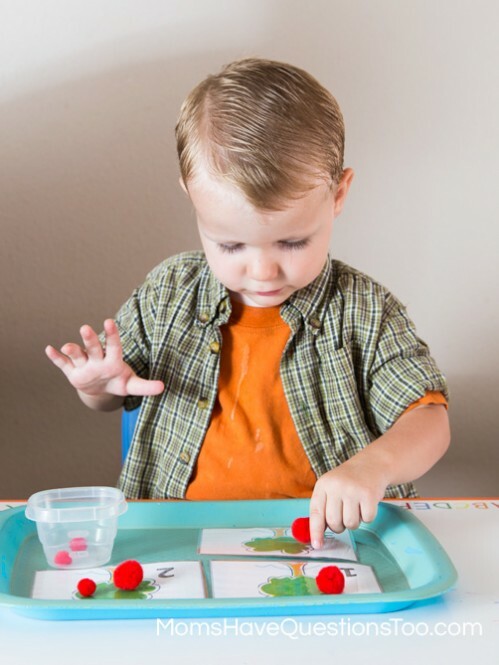 Added bonus, grabbing water beads with his fingers is fantastic fine motor practice! This tot tray has some number trees that I made, printed, and laminated. It also has some red pompoms. Smiley Man is supposed to put the correct number of “apples” onto each apple tree. We are still working just on numbers 1-3, but Smiley Man is really starting to understand the concept of counting. Wahoo! This tray has a piece of paper with a green vine drawn onto it. There is also a bottle of glue and bunch of red buttons. Smiley Man loves tomatoes, so I thought it would be fine for him to glue “tomatoes” onto a vine. Smiley used to hate glue bottles (he’d only use glue sticks), but he is really getting the hang of it now. I always save milk caps when we finish a gallon of milk so I decided to finally do something with some of the milk caps. I took all the red ones and hot glued magnets to the back. This tot tray is a cookie sheet so the milk caps stick to it. Smiley Man loves playing with the magnets and making pictures with them. He also likes sticking the milk cap magnets to each other. The Learning Notebook printables were a big hit this week. I usually have Smiley Man use dry erase crayons for this, but our bright dry erase crayons don’t have a red (only a pink) so I let him use a red dry erase marker instead. 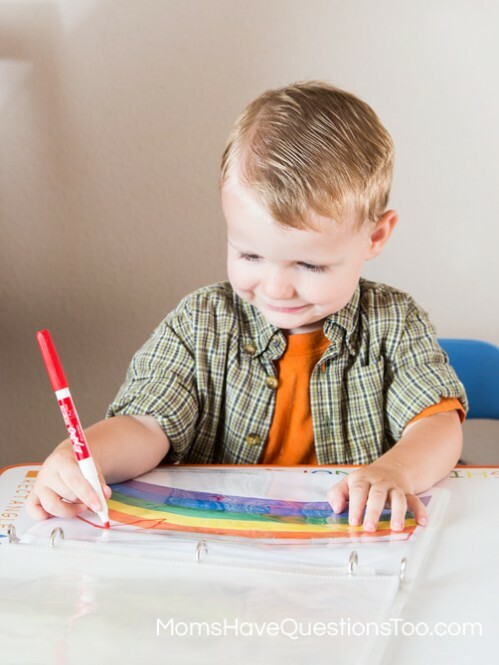 I’ll definitely stick to dry erase crayons most of the time (they’re washable! ), but it was fun to change things up a bit and use a dry erase marker. Overall, these red tot school trays were super fun for Smiley Man.